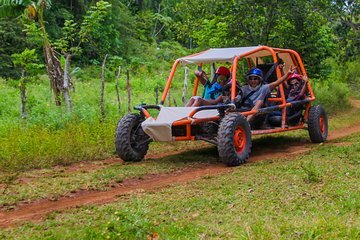 Vai fuori strada in buggy che si adatta a 5 persone durante questa avventura di 4.5 ore da Punta Cana. Guidati da una guida di avventura locale, segui un sentiero fuoristrada in campagna, fermandoti in una tipica casa dominicana per assaggiare caffè e cacao locali. Attraversa case colorate e attraversa un paesaggio di piantagioni di banane e terreni agricoli pieni di pecore, mucche e maiali. Ottieni fantastiche vedute della costa frastagliata sulla strada per la Fantasy Cave e Bedrock City, un'attrazione a tema Flinstones. Tutte le attrezzature e il trasporto di andata e ritorno dagli hotel di Punta Cana sono inclusi. Best time ever. All of us enjoyed it from my 70 yr old mother to our kids varying from 25, 21, 18, and 12. The people that work there were amazing. This was an amazing family experience! The 5 seat buggy was perfect for our family of 5. The guides were great and the Dominican countryside was beautiful. It is possible to go slowly through the puddles and stay mostly clean, so don't let the expect to get muddy reviews deter you, but I highly recommend blasting through the puddles and drenching yourself and all of your passengers. Bring a change of clothes in a plastic bag or just show up in trunks they have outdoor showers you can use to rinse off at the end. The cave was really cool to see, too. The small gift shop has cold beers when you're done and you can purchase a flash drive of video and pictures of the trip. The man there gave each of my 3 children a necklace with a small carved wood pendant. Very sweet. As I said before, a great family experience that we will cherish forever. Loved the activity, pick up was right on time and Ivan was a pleasure to have as our tour guide, definitely recommend it. We had a fun family day on this excursion. You will definitely get dirty. We went during the dry season, so no mud puddles, but plenty of dust. You need to wear a bandana and sunglasses. The guide was very friendly and shared information about the people of the area and the cave we explored. We were a family of three and the buggy could hold five. I would not recommend for elderly or young children under eight due to bumpy ride and the uneven steps in the cave. I would recommend this trip for a fun time. What a fun experience for the family! Four of us fit very comfortably in the dune buggy. The caves were amazing, and the tour guides were great. I have to give a huge shout out to Ivanhoe and Victor. My family got sick, and we needed to change the date of our reservation at the last minute. They were so accommodating and kind. They didnt charge me any cancellation fee and didnt give me any hassle whatsoever. I cant recommend this trip highly enough. It was such a fun day and a great way to see another side of the Dominican republic. It is a very nice day out with the family. The staff is great and very attentive. They make sure you have a fantastic day. Thanks Fran and all the staff, and thanks Francisca for a delicious warm coffee at her place. This tour was the best tour we did while in Punta Cana. The tour guide and photographer were both great and very informative, along with just being amazing people in general. We took full advantage of the puddles and came back super soaked. We did the walk of shame back at the resort but worth it! !